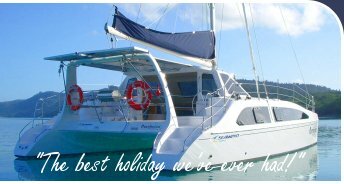 Purrfection, our Seawind 1160 - 38 foot catamaran, is located in the Whitsundays and is ready to provide you with the holiday of a lifetime. 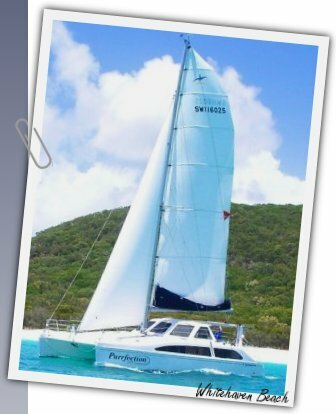 Purrfection is a particularly well optioned Seawind 1160 with many thoughtfully chosen features in addition to standard. Bareboat charter (sail yourself) or have a professional skipper provided to guide you. The luxurious saloon has unique tri-fold doors that lift up into the cockpit targa roof creating a splendid indoor outdoor area. It has a fabulous entertainment system, full headroom, 360 degree visibility plus huge forward opening windows for exceptional airflow. The epicurean galley is a joy to work in with great ventilation, generous workbench and storage areas, a large fridge, twin freezers and fabulous views. The double sinks include a carbon filter on the freshwater tap to ensure clean, purified drinking water. The 3 private cabins include 2 queensize beds and 1 double bed plus the port cabin has a stowable child's bunk and the saloon table converts to a large double bed providing flexible accommodation for family and friends. The spacious main bathroom has a separate fully enclosed shower stall and the forward cabin ensuite provides the convenience of a substantial second bathroom. The cockpit is well laid out with wide seats and a BBQ beneath the cover of the targa roof all within easy reach of the large cockpit fridge and ice box under the comfortably cushioned helm seats. You'll enjoy the impressive sailing attributes of Purrfection. With sail controls that lead back to the cockpit's twin helm stations, and its self-tacking headsail, this sleek, modern, performance catamaran practically sails itself. Twin Yanmar diesel motors with Gori 3-blade folding props enable fuel efficient travelling and manoeuvring when under power. A sailing holiday on Purrfection produces very little in greenhouse gas emissions; the wind in your sails drives the boat and solar power charges the batteries. With global warming threatening the long term survival of the Great Barrier Reef every bit helps. Purrfection is professionally managed for us by the wonderful team at Charter Yachts Australia located at Abel Point Marina, Airlie Beach, Queensland, Australia. Your charter includes briefings, a fully equipped galley, linen, snorkelling gear and more. To find out what packages and specials are available - use the enquiries form. © 2007- - all pages, documents and images on this website are protected by copyright law.